The Sun or Sol, is the star at the centre of our solar system and is responsible for the Earth’s climate and weather. The Sun is an almost perfect sphere with a difference of just 10km in diameter between the poles and the equator. The average radius of the Sun is 695,508 km (109.2 x that of the Earth) of which 20–25% is the core. 1. The SUN is just ONE of about 100 billion STARS in our GALAXY. 3. Its CORE temperature is 15 million º C.
4. Its SURFACE temperature is 5,500 ºC. Cooler (3,800 ºC) surface areas are called SUN SPOTS. 5. It is the LARGEST object in the SOLAR SYSTEM and makes up 99.8% of the total MASS of the Solar System. 6. It consists of 75% HYDROGEN and 25% HELIUM. 7. The ENERGY output of the Sun is about 386 billion megawatts and is produced by NUCLEAR FUSION, using Hydrogen as fuel. b. - Produces the AURORA BOREALIS or "The NORTHERN LIGHTS"
c. - Causes the characteristic TAILS of COMETS. 9. The Sun is about 4.5 BILLION YEARS old. It will probably continue to exist in its present FORM for about another 5 BILLION YEARS before RUNNING out of HYDROGEN. If a hollow Sun was filled up with spherical Earths then around 960,000 would fit inside. On the other hand if these Earths were squished inside with no wasted space then around 1,300,000 would fit inside. 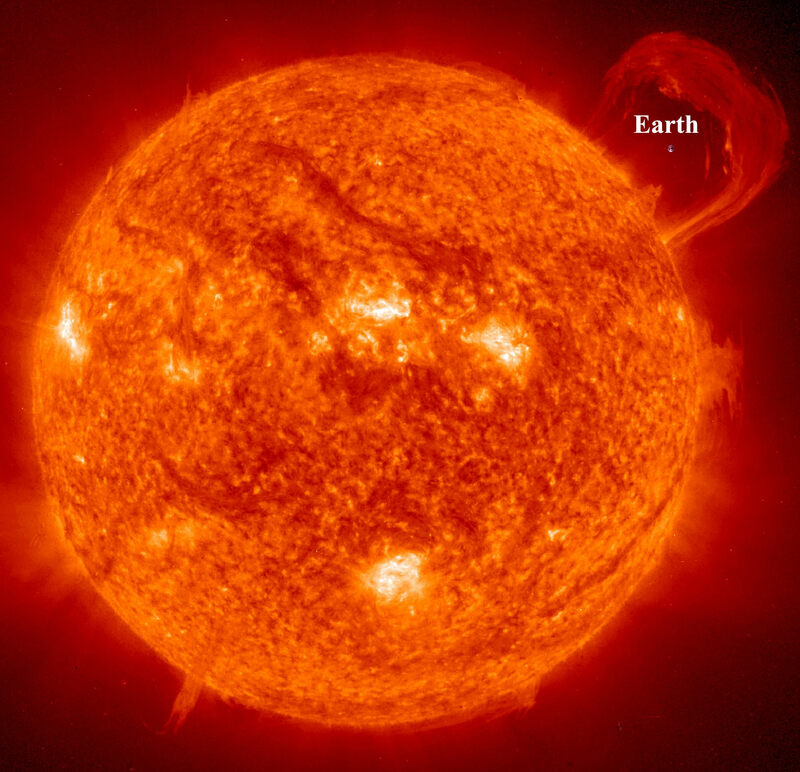 The Sun’s surface area is 11,990 times that of the Earth’s. There is only a 10 kilometre difference in its polar diameter compared to its equatorial diameter. Considering the vast expanse of the Sun, this means it is the closest thing to a perfect sphere that has been observed in nature. With a mean average distance of 150 million kilometres from Earth and with light travelling at 300,000 kilometres per second, dividing one by the other gives us an approximate time of 500 seconds, or eight minutes and 20 seconds. Although this energy reaches Earth in a few minutes, it will already have taken millions of years to travel from the Sun’s core to its surface. The Sun is 24,000-26,000 light years from the galactic centre and it takes the Sun 225-250 million years to complete an orbit of the centre of the Milky Way. Because the Earth travels on an elliptical orbit around the Sun, the distance between the two bodies varies from 147 to 152 million kilometres. The distance between the Earth and the Sun is called an Astronomical Unit (AU). Solar flares occur when magnetic energy is released by the Sun during magnetic storms, which we see as sunspots. In sunspots, the magnetic lines are twisted and they spin, much like a tornado would on Earth. At the Sun’s core, energy is generated by nuclear fusion, as Hydrogen converts to Helium. Because hot objects generally expand, the Sun would explode like a giant bomb if it weren’t for its enormous gravitational force. This is a stream of charged particles, which travels through the Solar System at approximately 450 kilometres per second. Solar wind occurs where the magnetic field of the Sun extends into space instead of following its surface. The Sun is by far the largest object in the solar system. 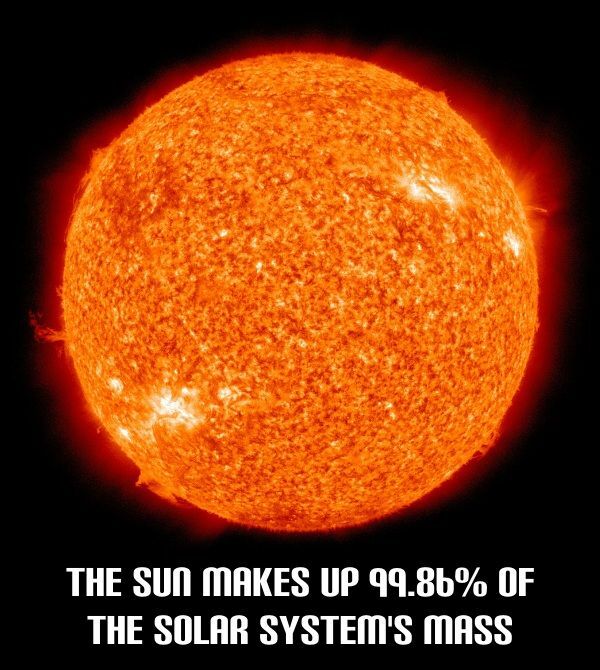 It contains more than 99.8% of the total mass of the Solar System (Jupiter contains most of the rest). It is often said that the Sun is an "ordinary" star. That's true in the sense that there are many others similar to it. But there are many more smaller stars than larger ones; the Sun is in the top 10% by mass. The median size of stars in our galaxy is probably less than half the mass of the Sun. The Sun is personified in many mythologies: the Greeks called it Helios and the Romans called it Sol. The Sun is, at present, about 70% hydrogen and 28% helium by mass everything else ("metals") amounts to less than 2%. This changes slowly over time as the Sun converts hydrogen to helium in its core. The outer layers of the Sun exhibit differential rotation: at the equator the surface rotates once every 25.4 days; near the poles it's as much as 36 days. This odd behavior is due to the fact that the Sun is not a solid body like the Earth. Similar effects are seen in the gas planets. The differential rotation extends considerably down into the interior of the Sun but the core of the Sun rotates as a solid body. Conditions at the Sun's core (approximately the inner 25% of its radius) are extreme. The temperature is 15.6 million Kelvin and the pressure is 250 billion atmospheres. At the center of the core the Sun's density is more than 150 times that of water. The surface of the Sun, called the photosphere, is at a temperature of about 5800 K. Sunspots are "cool" regions, only 3800 K (they look dark only by comparison with the surrounding regions). Sunspots can be very large, as much as 50,000 km in diameter. Sunspots are caused by complicated and not very well understood interactions with the Sun's magnetic field. A small region known as the chromosphere lies above the photosphere. The highly rarefied region above the chromosphere, called the corona, extends millions of kilometers into space but is visible only during a total solar eclipse (left). Temperatures in the corona are over 1,000,000 K.
It just happens that the Moon and the Sun appear the same size in the sky as viewed from the Earth. And since the Moon orbits the Earth in approximately the same plane as the Earth's orbit around the Sun sometimes the Moon comes directly between the Earth and the Sun. This is called a solar eclipse; if the alignment is slighly imperfect then the Moon covers only part of the Sun's disk and the event is called a partial eclipse. When it lines up perfectly the entire solar disk is blocked and it is called a total eclipse of the Sun. Partial eclipses are visible over a wide area of the Earth but the region from which a total eclipse is visible, called the path of totality, is very narrow, just a few kilometers (though it is usually thousands of kilometers long). Eclipses of the Sun happen once or twice a year. If you stay home, you're likely to see a partial eclipse several times per decade. But since the path of totality is so small it is very unlikely that it will cross you home. So people often travel half way around the world just to see a total solar eclipse. To stand in the shadow of the Moon is an awesome experience. For a few precious minutes it gets dark in the middle of the day. The stars come out. The animals and birds think it's time to sleep. And you can see the solar corona. It is well worth a major journey. The Sun's magnetic field is very strong (by terrestrial standards) and very complicated. Its magnetosphere (also known as the heliosphere) extends well beyond Pluto. In addition to heat and light, the Sun also emits a low density stream of charged particles (mostly electrons and protons) known as the solar wind which propagates throughout the solar system at about 450 km/sec. The solar wind and the much higher energy particles ejected by solar flares can have dramatic effects on the Earth ranging from power line surges to radio interference to the beautiful aurora borealis. Recent data from the spacecraft Ulysses show that during the minimum of the solar cycle the solar wind emanating from the polar regions flows at nearly double the rate, 750 kilometers per second, than it does at lower latitudes. The composition of the solar wind also appears to differ in the polar regions. During the solar maximum, however, the solar wind moves at an intermediate speed. Further study of the solar wind will be done by Wind, ACE and SOHO spacecraft from the dynamically stable vantage point directly between the Earth and the Sun about 1.6 million km from Earth. The solar wind has large effects on the tails of comets and even has measurable effects on the trajectories of spacecraft. Spectacular loops and prominences are often visible on the Sun's limb (left). The Sun's output is not entirely constant. Nor is the amount of sunspot activity. There was a period of very low sunspot activity in the latter half of the 17th century called the Maunder Minimum. It coincides with an abnormally cold period in northern Europe sometimes known as the Little Ice Age. Since the formation of the solar system the Sun's output has increased by about 40%. The Sun is about 4.5 billion years old. Since its birth it has used up about half of the hydrogen in its core. It will continue to radiate "peacefully" for another 5 billion years or so (although its luminosity will approximately double in that time). But eventually it will run out of hydrogen fuel. It will then be forced into radical changes which, though commonplace by stellar standards, will result in the total destruction of the Earth (and probably the creation of a planetary nebula). The Sun is a huge ball of incandescent plasma at the center of our Solar System. It accounts for more than 99.86% of the mass of the Solar System, and provides all the energy we need for life here on Earth. Ancient civilizations, such as the Romans worshipped the Sun because they saw it as something that brought life. It was given various names such as Sol by the Romans and Helios by the Greeks. And perhaps that worship was reasonable, for without the Sun, life on Earth just wouldn’t be possible. The Sun’s diameter is 1,392,000 kilometres or 865,000 miles; that’s 109 times the diameter of the Earth. You could fit 1.3 million planets the size of the Earth into the Sun. Everything in the Solar System orbits around the Sun, including 8 planets and their moons, many dwarf planets, asteroids, comets and dust. The mass of the Sun really dwarfs the mass of any other object in the Solar System; for exampel, it has 333,000 times the mass of Earth. If the Sun were hollow, you could fit more than one million Earths inside of it – you could only fit 1300 Earths inside of Jupiter. The Sun formed 4.6 billion years ago from a vast cloud of gas and dust called the Solar Nebula. Over millions of years, this gas and dust collected into the Sun and the planets. Once the Sun’s gravity compressed its hydrogen enough, temperatures in the core reached the point of igniting solar fusion, releasing the energy we feel here on Earth. Although it’s currently in the main sequence phase of life, the Sun is slowly heating up. It’s expected to last for another 7 billion years or so. Once all the usable hydrogen in the core runs out, the Sun will expand outward into a red giant, consuming the inner planets (maybe even Earth). Then it will slough off its outer layers and collapse inward to become a white dwarf star. The surface of the Sun that we can see is called the photosphere, and it has an average temperature of about 5,800 kelvin. This is the point at which photons generated inside the Sun finally reach the vacuum of space. 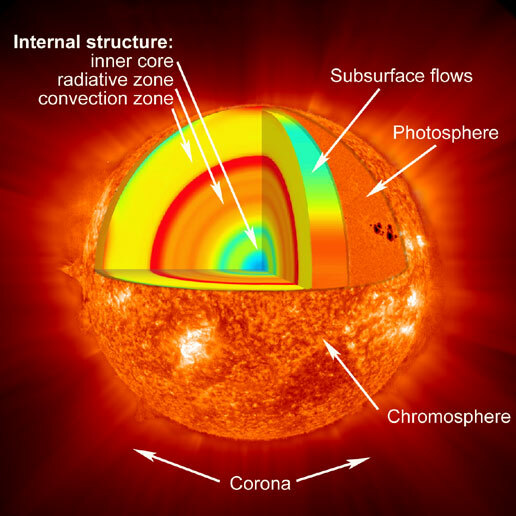 The Sun’s surface is composed of a number of layers including the photosphere, the chromosphere, and the corona, which are all the outer layers. But if you could descend down into the Sun, you would find the temperature and pressure increasing until you reached the core of the Sun. At the core, the temperature is 15.7 million kelvin and the pressure is sufficient to support nuclear fusion. This is where protons are merged together to form atoms of helium, releasing tremendous amounts of energy. Because the Sun is made of plasma, it’s also highly magnetic. It has north and south magnetic poles like the Earth, and the magnetic field lines create the activity we see on the surface. The darker sunspots are created when magnetic field lines pierce through the Sun’s photosphere. Coronal mass ejections and solar flares occur when these magnetic field lines snap and reconfigure. The amount of activity on the Sun rises and falls over an 11-year cycle. At the low point, called solar minimum, there are few, if any sunspots. And then at the high point of the cycle, solar maximum, there are the most sunspots and the greatest amount of solar activity. The Sun does much more to protect us than just provide heat. It lets off solar winds and material that travels out into space. If we did not have the Earth’s magnetic field, then this material would kill us. However, the solar winds carry out the charged material to the edge of the Solar System where it forms a magnetic field that prevents other interplanetary material from getting in. This barrier is known as the heliopause and without it the Solar System will be battered by cosmic rays. 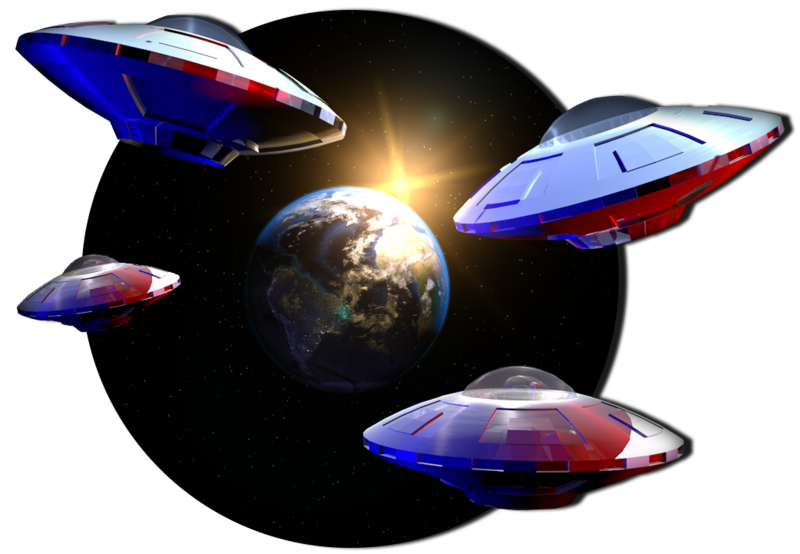 The charged particles carried by solar winds also interfere with satellites, power lines, and other technology on Earth as well as causing the aurora borealis. Sunlight is vital to our planet, and it takes approximately eight minutes for that light to reach Earth. It depends on where the Earth is in its orbit and how far away it is from the Sun at the time. 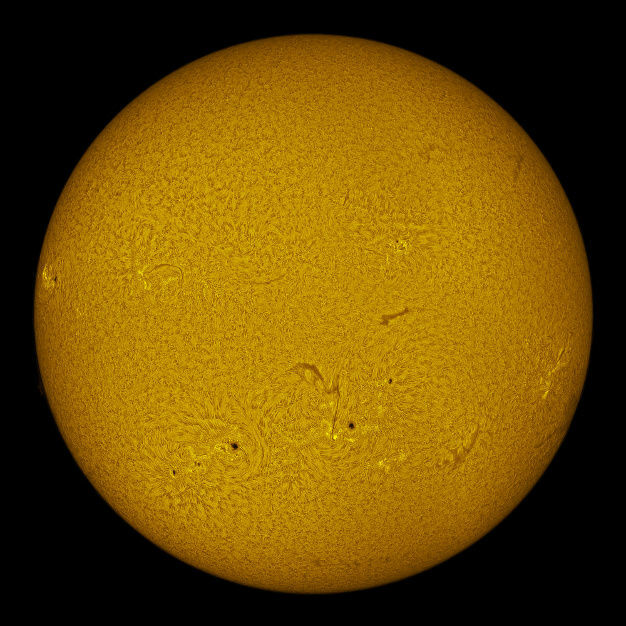 Although our Sun appears to be yellow, it is actually white. It merely appears to be yellow because of the effect of the atmosphere. Scientists used to believe that the Sun was not really that impressive of a star. With further studies though, they have come to realize that it is brighter than most of the other stars in the galaxy, which are red dwarfs. The Sun takes about 1 month to rotate once on its axis; however, this is a rough estimate because the Sun is a ball of plasma. Some parts of the Sun rotate faster than other parts, so it’s hard to say when it has completed a full rotation. The Sun is composed almost entirely of hydrogen (74%) and helium (25%), with other trace elements. The innermost layer of the Sun is the core, where the nuclear fusion reactions are taking place. Outside that is the radiative zone, where photons of gamma radiation created in the core are emitted and absorbed by hydrogen atoms. A single photon can take 100,000 years to finally get through the radiative zone. Outside the radiative zone is the convective zone, where bubbles of plasma rise and fall like a lava lamp. The Sun is made up of different layers that actually rotate at different speeds. Because the Sun is more similar to a gas giant in that it is high in helium and hydrogen, it also experiences what is known as differential rotation. At the outer layers, near the equator it rotates about once every 25.4 days while near the poles it takes up to 36 days to complete one rotation. Sunspots are cooler areas on the surface of the Sun, which last up to a few months and vary greatly in size. Sunspots appear in cycles and sometimes there appear to be none on the Sun at all. Scientists are still trying to learn more about sunspots. Only about 5% of stars in the Milky Way are larger than the Sun; the vast majority are smaller red dwarf stars. Some of the biggest stars can be 100,000 times brighter and contain 100 times more mass. The Sun is also relatively young, a member of the Population I group of stars. Older stars, which formed billions of years before the Sun are Population II stars and have less heavier elements in them. The oldest stars are Population III stars, formed just after the Big Bang, but these are purely theoretical. Earth compared to the sun. The solar atmosphere is where we see features such as sunspots and solar flares on the sun. The sun's outer atmosphere -- the corona -- extends beyond the orbit of dwarf-planet Pluto. Spacecraft are constantly increasing our understanding of the sun -- from Genesis (which collected samples of the solar wind and returned the particles to Earth) to SOHO, STEREO THEMIS, and many more, which are examining the sun's features, its interior and how it interacts with our planet. Without the sun's intense energy there would be no life on Earth. The temperature at the sun's core is about 15 million degrees Celsius (27 million degrees Fahrenheit). The Nine Planets, and their orbital and physical data. JPL Solar System Dynamics, with the small-body database, orbit diagrams, formulae for converting Keplerian to Cartesian orbital elements, plus loads more! Airglow above the northern India-Pakistan border. 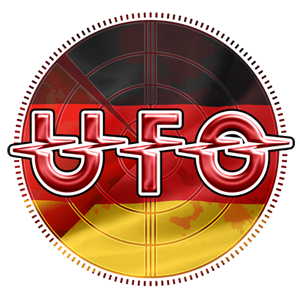 Heute waren schon 33870 visitors (72205 hits) hier!